THE ASHES OF JEDHA CONCLUDES! The battle between the Empire and the Rebellion over the Kyber mines of Jedha comes to an explosive conclusion…with help coming from the most unexpected source. Star Wars #43 is the one title from Marvel that walks the fine line of tying a story to the original trilogy while expanding on new characters with interesting and complex story arcs. 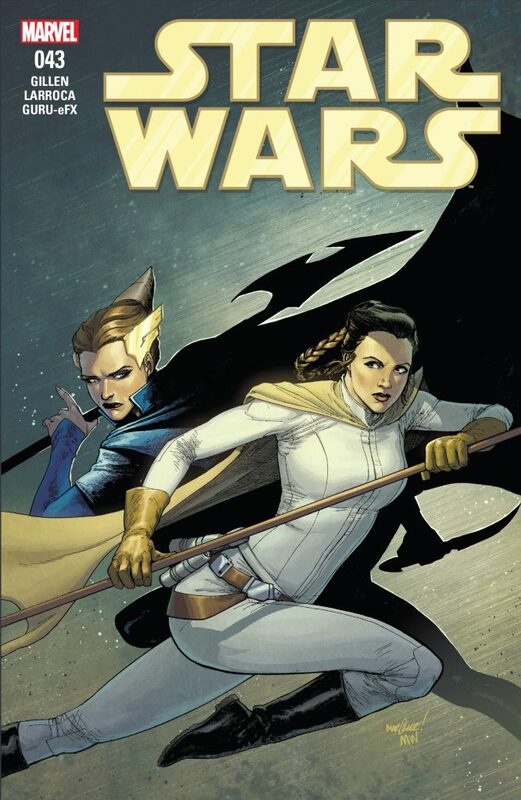 I give most of the credit for this to writer Kieron Gillen who has the knack of writing original stories while maintaining a link to the movies all while expanding the Star Wars universe in familiar yet unique directions. In the final chapter of The Ashes of Jedha Gillen gives us a surprising turn in the inevitable face-off between Princess Leia and Queen Trios of Shu-Torun. Gillen has also given our familiar heroes new challenges and fresh character growth of both Han and Luke. Han steps up to become a leader he didn’t know was inside him and Luke faces off with a foe that forces him to use more than just his growing Jedi powers to overcome. 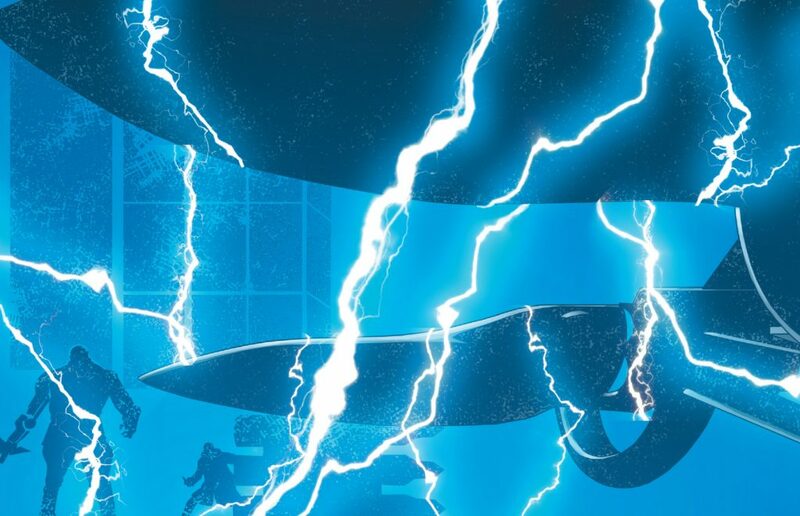 Like Charles Soule’s take on the growth of Darth Vader, Gillen has the unique qualities as a writer to express new layers and depths of characters Star Wars fans believe they know all too well. It’s incredibly refreshing to read such good character dynamics while expanding on the aftermath of the Empire’s attack and ultimate death of Jedha. The art from Salvador Larroca, while less egregious with the photorealistic use for characters faces, is still a hurdle I have yet to overcome with this title. I wish the depictions of the characters fell a little more in line with cover artists David Marques & Matthew Wilson but with that said, Larroca does have a knack for his work when it comes to action and pacing. The ships, the chaos on Jedha and the use of shadows to depict the darkness that is engulfing the planet are all spot on and a great use of Larroca’s talent. The linework and detail of the Millennium Falcon, the massive Imperial Orbital Drill, C-3PO and even Chewbacca show some real skill for illustration and is a stand-out among Larroca’s work. 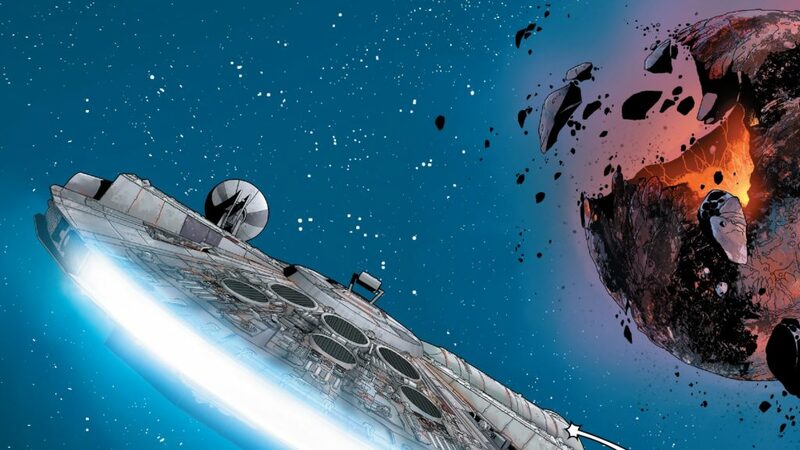 All in all, this is a very satisfying wrap-up to an episodic storyline that I have long been hoping for in the Star Wars title that spent so many issues prior as essentially one-shot stories. This is where I was hoping this title was leading and Gillen delivered in spades all while setting up a new direction and arc for our main characters to follow. I look forward to what’s next as this final chapter wraps up Jedha’s, and essentially Rouge One’s, epilogue in anticipation of rebuilding the rebellion. This is the best of what Star Wars stories off the big screen should be.